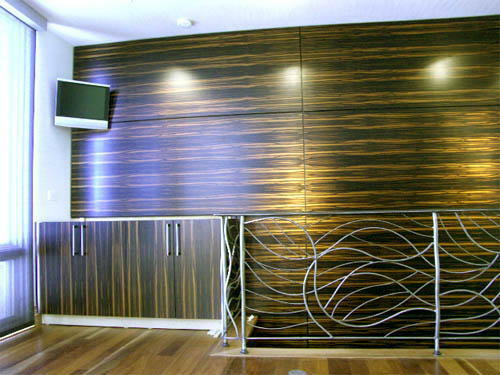 We built this Macasser Ebony wall panel system for a home in Colorado. The panel system actually covers both walls of the stairwell and spills out into an alluvial hallway with art niches on either side. The first challenge was to find a sequence that was big enough to provide as many panels as it took to do this. The second challenge was to center balance, stack and end match all those panels. 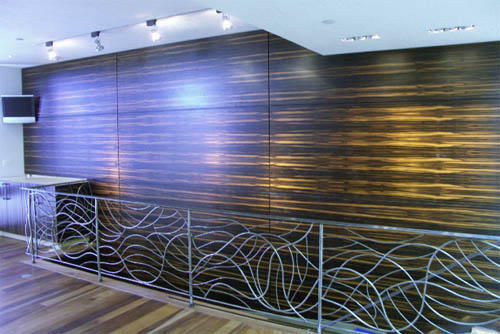 This was a fairly difficult task to accomplish for both Wood River Veneer and the installing shop. There was some hair pulling on both of our behalves. Ultimately, it ended up working out well and, as you can see, the Ebony makes a very dramatic statement.